There is a Quake2 HOWTO written by Bob Zimbinsky that should be your first stop. It should be your first stop because even though dated, it provides useful details on how to launch mods and fix problems. There is also an interesting Wikipedia page for Quake2. It is quite amazing to me that this game was released way back in 1997 as the second installment to ID's Quake series. I've played it ever since the release; it has quite a following. 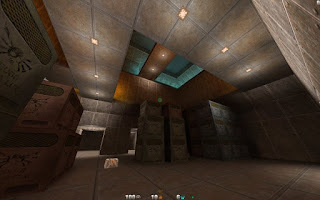 Since id Software released the source code for the Quake2 game engine, there have been several projects that have attempted to make not only a better playing game, but a better looking game. The game itself can be purchased from Amazon, GOG, eBay, or STEAM. There is no special code or password to unlock, run or install the game. In addition to the win32 game engine supplied with the original release as well as the GOG and STEAM releases, there are several different game engines and hi-res packs to choose from. What I'm presenting here is how I configure Quake on my Linux box. The game engine I use is the Yamagi Quake2 Engine, the game engine supplied in my Mageia6 distro. It features numerous improvements in the game engine itself while retaining the same gameplay experience. The homepage notes that "Yamagi Quake II is supported on FreeBSD, Linux, Mac OS X, OpenBSD and Windows (XP or higher). Porting to other (POSIX compliant) systems should be easy." The current version was released in June, 2017. The installer creates the game directory tree in /usr/lib64/games/quake2 (for my 64-bit system and /usr/lib/games/quake2 for a 32-bit system). The first time you launch the game ( and you ca do it without the game data being present), it will create ~/yq2/baseq2 and populate that with a few files. Remember, none of these packages includes the game data files, you need to get those from an original installation disk, GOG.com or STEAM. If you do not won the games, you can obtain the demo version and use that in the same following manner. Obtain the Game Data FilesI have the GOG version of Quake2. It comes in a win32 Inno Setup archive that can be unpacked with the innoextract utility. Mageia provides that utility, otherwise you could get a Linux binary (or the source code to compile your own) from here. The inpacked game file tree will be found in the resulting /app subdirectory. You can place the game data files in your ~/.yq2/baseq2 directory or in /usr/lib64/games/quake2/baseq2 for all users of your system to enjoy. I prefer to place the original game data in the /usr/lib file structure and place any modifications (like hi-res textures) in my home directory. That makes it easy to experiment with different modifications without having to re-install the game. From the unpacked archive, copy everything to its corresponding location in /usr/lib. You may delete any .DLL and .EXE files. To use the demo version game data (it's free of charge), get the demo version from the Yamagi website and follow the same steps. On first start, a .yq2 directory will be created in your home directory. You can easily place mods and maps there. Quake2 has gotten on updated look with 32-bit textures from the original 16-bit textures. Hi-res textures can be downloaded from ModDB here and placed in ~/home/.yq2/base2. It looks spectacular. There are mods, maps, and so much more fan-created goodness that can be found by browsing the links below. The yamagi-quake2 game engine supports more screen resolutions than the original, but if those do not suit your needs, create the file ~/.yq2/baseq2/autoexec.bat if it does not already exist and enter the following lines, substituting the custom resolution you desire. No Quake game is complete without cheats and walkthroughs to get you past those tough situations.